There was hardly a shortage of dramatic storylines entering the Final Four in San Antonio this past weekend. Primarily, would Loyola-Chicago’s remarkable Cinderella run continue or meet its fateful end against Michigan? Could Michigan become the first Big 10 team to win a national championship since its bitter rival Michigan State in 2000. Would Bill Self finally cement himself as the greatest coach in the country by bringing a trophy back to Lawrence, KS with his least-talented team in over a decade? And could Villanova cap off the most dominant three-year run in recent college basketball memory by earning its second championship in a three-year span? Those were questions that could only be answered on the hardwood. The first game of the weekend was between 11-seed Loyola and three-seed Michigan. However, for Sister Jean and the Ramblers, Loyola-Chicago sadly met its match in Michigan and its remarkable tournament run came to an end. Loyola took a seven-point lead into the locker room at halftime, which at one point became a 10-point lead in the second half. It was at that moment, though, that Michigan buckled down on defense to get itself back into the game, forcing the highly-efficient Loyola offense into 17 turnovers. Offensively, the 6’11” Moritz Wagner took over for the Wolverines, scoring 25 points to go along with 15 rebounds, which helped lead Michigan to a 69-57 win over the Ramblers. The other Final Four matchup featured two of the tournament’s one-seeds, Villanova and Kansas. From the game’s onset, Villanova was simply too much for Kansas. The Wildcats came out firing and it felt as if they could not miss the entire first half. By halftime, Villanova was already up 47-32 and it seemed Kansas never stood a chance. The second half was much of the same, as Villanova continued its offensive onslaught to a tune of 18-40, shooting (45 percemt) on three-pointers as a team. Their offensive attack was extremely balanced all game — all five starters scored in double figures as did Donte DiVincenzo, who had 15 off the bench — and Villanova defeated the Jayhawks 95-79. The national title game between Villanova and Michigan was much of the same for Villanova Head Coach Jay Wright’s team. About midway through the first half, Michigan had jumped out to a 21-14 lead and seemed to be in command thanks to its stout defense. That’s when cats. DiVincenzo scored 18 first-half points and helped Villanova to close out the half on a 23-7 run. In the second half, Nova picked up right where they left off and were in complete command of the game for every moment. Their lead never dipped below 14 points. Much like in the first half, DiVincenzo lead the way for the Wildcats, totaling 31 points on 10-15 shooting, including 5-7 on three-pointers. Mikal Bridges also added 19 points for Villanova, but no other Wildcat scored in double figures as Jalen Brunson and company continually deferred to DiVincenzo’s hot hand. After dominating the entire game, Villanova became national champion for the second time in three years by defeating Michigan 79-62. This national championship game was very representative of both Villanova’s entire tournament run and its regular season. Throughout the tournament, Villanova’s smallest margin of victory was 12 points in its Sweet 16 matchup with West Virginia. 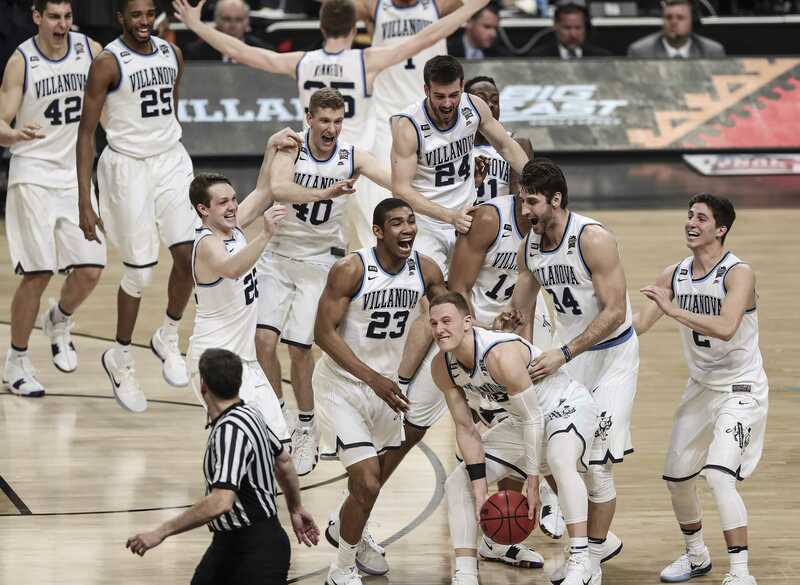 It was truly one of the most dominant tournament runs in recent memory and it is difficult to think of another college basketball team that cruised through the tournament the way these Wildcats did. In a tournament that seemed to embody the term “March Madness,” it was the most complete and most consistent team that came out on top. Since the beginning of the season, Villanova had clearly been the class of the country and they proved that with this statement run. This championship cements Jay Wright’s status in college basketball’s upper echelon of coaches. Few coaches have achieved dynasties quite like Wright has at Villanova. Winning two championships in a three-year span in the one-and-done era is nothing short of amazing. Wright has turned his program into an unstoppable force that is now viewed in the same light as schools like Duke, North Carolina, Kentucky and Kansas. DiVincenzo’s championship coming out party is the perfect testament to the player-development machine Wright has built in his tenure at Villanova.